The Karpaz region with its beautiful peninsula is known as the pan-handle by many. If you look at the map of Cyprus, the Northern thin part resembles a pan's handle. This North-eastern region of Cyprus is by far the most beautiful with its undeveloped landscape of untouched beauty. Empty beaches, mountains, and stunning scenery make is an amazing spectacle to see. As it is relatively remote from main towns it still remains empty and presents what nature delivered her with, natural and stunning untouched beauty. Here you will enjoy beaches alone or maybe with one other. The amount of space in this region means you will have total privacy, but also enjoy nature at its finest. The beaches which easily rival Caribbean beaches are often enjoyed alone, you may sometimes have the company of a few turtles which choose this region as their home each year. let's not forget the wild donkeys as these are iconic to the region, as the national park is home to them. As North Cyprus is fairly small, it takes a few hours from Kyrenia to get here and 1.5 hours from Famagusta. It can be enjoyed on a day trip, but many like to stay an evening and take it all in... And we don't blame them. Looking for a holiday to Karpaz? 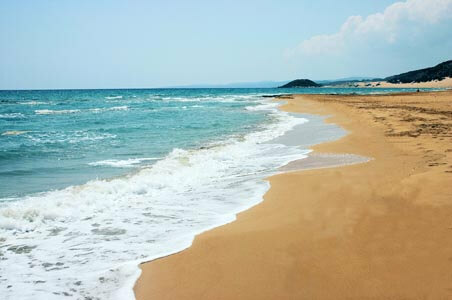 Book a cheap holidays to Karpaz North Cyprus with Direct Traveller.